Budget: 12 Millionen US Dollar. Budget: 12 million U.S. dollars. 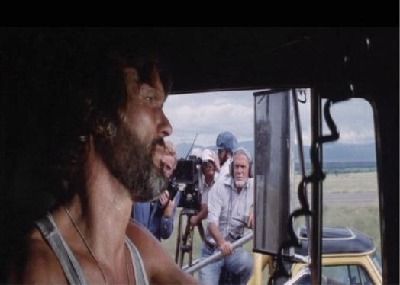 Folgendes Bild zeigt Sam Peckinpah in einer CONVOY Filmszene. 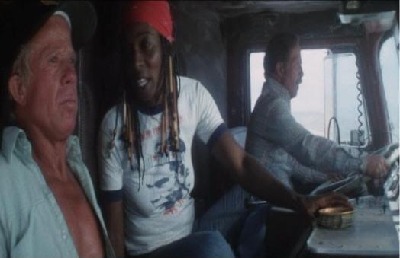 Im Film erscheint das Filmteam als das Fernsehteam was die Trucker interviewt. 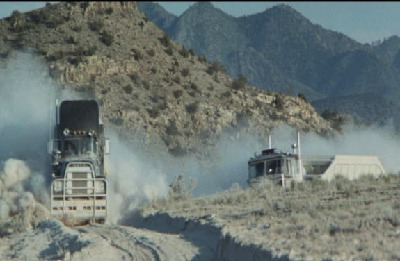 The following picture shows Sam Peckinpah in a scene from the movie CONVOY. 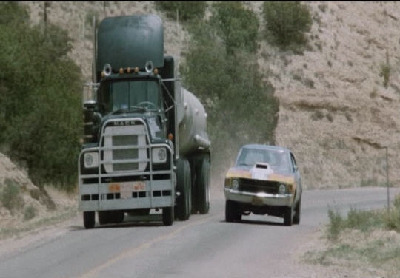 In the movie a television news-team tries to interview the truckers as they drive along the highway ... that "television news-team" is actually one of the movie's film-teams. Bei den Dreharbeiten sind zwei Film Szenen entstanden die nicht im Drehbuch standen. Der Truck von Widow Women sollte in der Kurve nicht umkippen und der Sportwagen mit dem Lyle Wallace über die Scheune flog, sollte eigentlich in die Scheune fliegen. Bei beiden Szenen ist niemand verletzt wurden und Dank der Aufmerksamkeit der Kamera Leute und dem hieraus bestehendem verwendbaren Filmmaterials konnten diese beiden Szenen dann auch im Film verwendet werden. Two scenes in the movie were not supposed to happen. 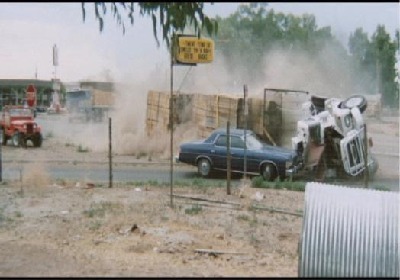 The white truck of "Widow Woman" was not supposed to overturn on the curve in the road and the sports car driven by "Lyle Wallace" was supposed to fly into the barn, not over the barn. 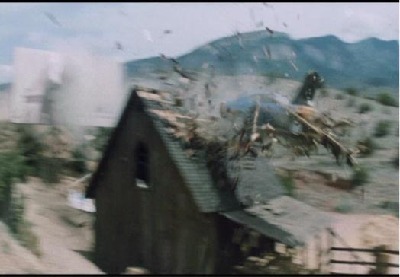 Fortunately nobody was injured while filming theses scenes and thanks to the careful attention of the camera people they were incorporated into the movie. Widow Women trägt im Film ein T-Shirt mit einem Aufdruck des Gesichts von Regisseur Sam Peckinpah und der Aufschrift YOUR UNCLE SAM WANTS YOU ! Widow Women carries in the movie a shirt with a imprint of the face of director Sam Peckinpah and the writing YOUR UNCLE SAM WANTS YOU ! Sam Peckinpah verstarb am 28.12.1984 mit 59 Jahren. Madge Sinclair verstarb am 20.12.1995 mit 57 Jahren. Bill Coontz verstarb am 07.04.1978 mit 62 Jahren. Spec O’Donnell verstarb am 14.10.1986 mit 75 Jahren. Jorge Russek verstarb am 30.07.1998 mit 66 Jahren. Ernest Borgnine verstarb am 08.07.2012 mit 95 Jahren. 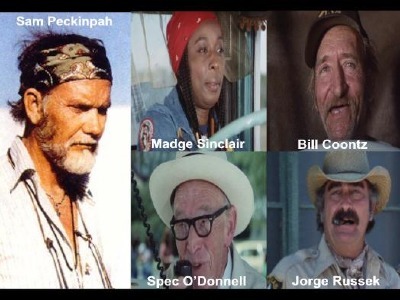 Sam Peckinpah died on 28.12.1984 at the age of 59 years. Madge Sinclair died on 20.12.1995 at the age of 57 years. Bill Coontz died on 07.04.1978 at the age of 62 years. Spec O’Donnell died on 14.10.1986 at the age of 75 years. Jorge Russek died on 30.07.1998 at the age of 66 years. 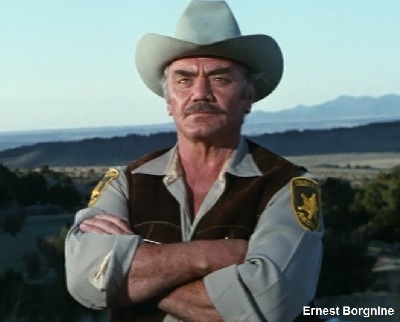 Ernest Borgnine died on 08.07.2012 at the age of 95 years.